Metropolitan Police in Trafalgar Square. However, trends in reported crime don’t necessarily reflect changing levels of actual crime. Reported crime is influenced by changes in recording practices and changing behaviour of the public in reporting crime. The ONS believes improved recording practices are driving much of the rise but they also believe actual, not just reported, crime is increasing in several categories, amongst which violent crime. Violent crime, and particularly knife crime has been getting most attention in Croydon. You can check the latest figures here but we were in the top three London Boroughs for murder with eleven this year to the 30th of June compared to only four in the previous twelve months. 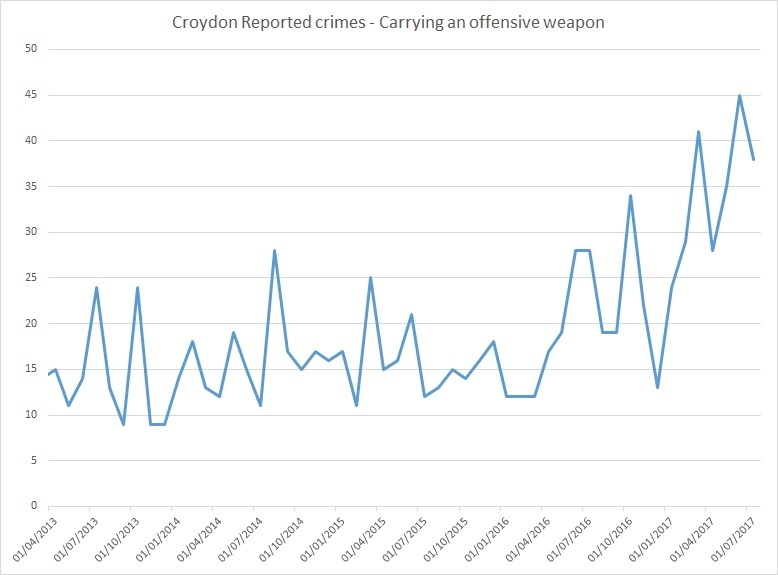 Croydon’s monthly statistics for carrying an offensive weapon cases are typical, showing the recent rises. Knife crime among the under-25s has been a particular issue. Recent murders in Croydon have mostly been young men killed by stabbing. In response the London Mayor has published a Knife Crime Strategy and Sarah Jones, the MP for Croydon Central, has launched an all party parliamentary group. Our politicians both locally and nationally need to be at the forefront as we figure out what to do. And what should we do? Young people choose to carry knives, and are then using them to devastating effect. What are our options? Restricting access to knives is one possibility but we already have some of the strictest laws in the world. Further restriction may have some effect but knives are everyday objects with legitimate uses. A kitchen knife is still a deadly weapon. The difficult task of persuading young people not to carry a knife in the first place is where we need to look for lasting success. This is a complex matter with many inter-related factors. It isn’t going to be easy, yet too often discussion gets simplified into a discussion on police numbers. Let’s look at the figures. According to a recent House of Commons briefing paper the Metropolitan Police had 32,125 Officers at 31st March 2016, 0.8% up on the previous year. Numbers have increased every year since 2013. 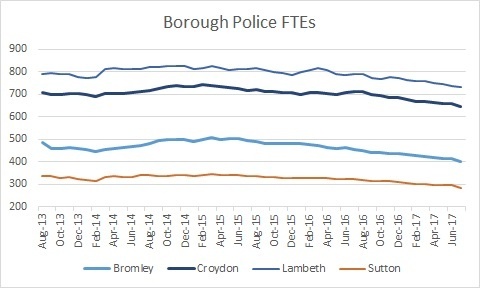 Looking closely at Croydon’s Borough policing manpower the graph shows a downward drift in numbers especially since Sadiq Khan took over in May 2016, not only in Croydon but elsewhere. However this isn’t the full story. These figures are just those police who report to our Borough Commander. Territorial policing, as it is called, also has manpower with a pan-London remit deployed in Croydon. Crimes such as child abuse, sexual offences and road traffic fall under this category. Add these to the direct borough policing and the territorial policing numbers are roughly flat across London since 2013. Bottom line, we have roughly the same number of police across London and likely on the ground in Croydon. There are still good questions to ask about our policing. Are we prioritising the right things? Politicians’ obsession with police numbers, because that resonates with the public, can encourage inefficiency. The Met has notoriously antiquated IT systems which tie up officer time. Warranted officers run office services and the like. If keeping officer numbers up is being prioritised rather than employing people with the right skills or investing in modern IT we are not making the right decisions to improve police effectiveness. “Community policing” is another comfortable epithet that warrants examination. What does that mean? Assigning some officers to specific areas (ward level in Croydon) so they become familiar with the local environment and people sounds fine; but does that necessarily mean (another favourite epithet) ‘bobbies on the beat’ and what is the evidence that it is effective? If information were to be passed on, the likely consequence is a stop-and-search, itself controversial. The Met’s Stop-and-Search dashboard shows that in Croydon there were 4419 stop-and-searches in the period September 2016 to July 2017, 19.5% of which were for knives and similar. Croydon stop-and-searches for all reasons resulted in some action in close to one third of cases, the majority of which were arrests – not a bad success rate. A review and recommendation on this important tool would be helpful. But the reality is that home, school, peers and the wider environment are the major influences on a young person’s decision to carry a knife. That is where we need to look for long term solutions. The police are surely part of the equation but if they need to do something different let’s come up with solid, reasoned, evidence-based proposals before we start talking about police numbers.